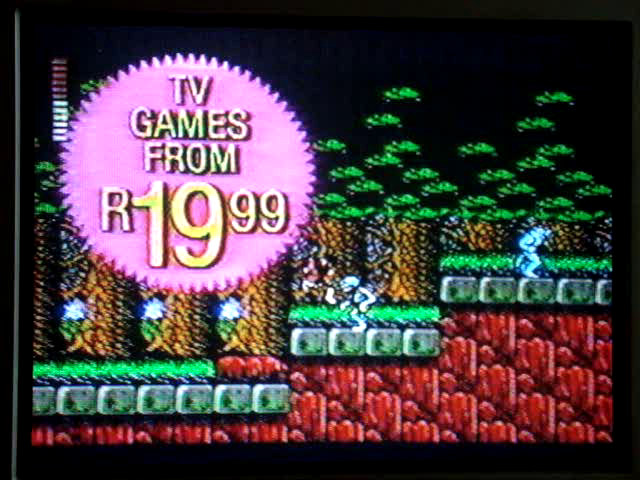 It’s taken 20 years to get here, but I’ve finally archived one of the Reggies TV Entertainment System adverts which were shown on South Africa TV – likely from Saturday 2nd November 1991. Recently I interviewed David Hayter for GamesTM magazine (the article is due out 22 December – expect scans from myself). It was epic, and he’s a great guy, very funny and eloquent. After this I decided to watch an old tape of Guyver Dark Hero which I had, since it stars Mr Hayter, and I thought I’d do a review for here. Anyway, turns out halfway through, the tape starts skipping to the point where it’s unwatchable. I lift the flap and notice the tape itself has started curling at the edge, causing a series of grooves. Probably due to poor storage on my part – left it at the bottom of an old cabinet. 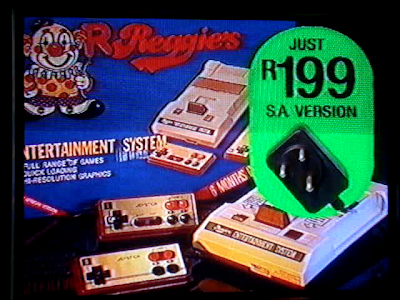 Suddenly it dawns on me that I have even older tape, with home recorded footage from South Africa, featuring an advert for the Reggies Entertainment System, which was a Famicom clone branded by one of South Africa’s leading toy stores. 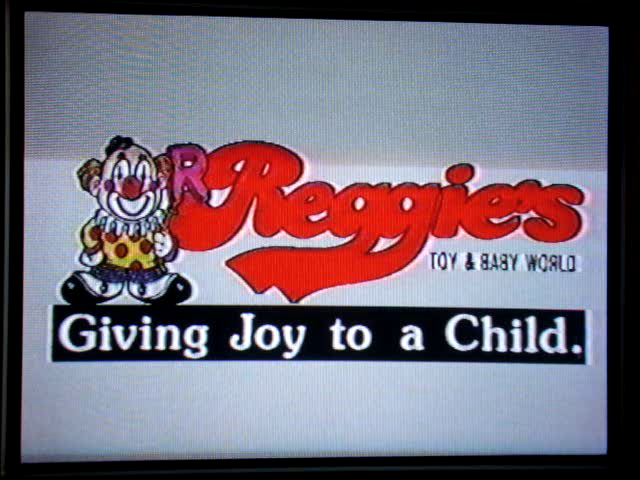 Reggies is kind of a competitor to Toys R Us. I wrote about Christmas in South Africa for The Escapist before, mentioning this tape. 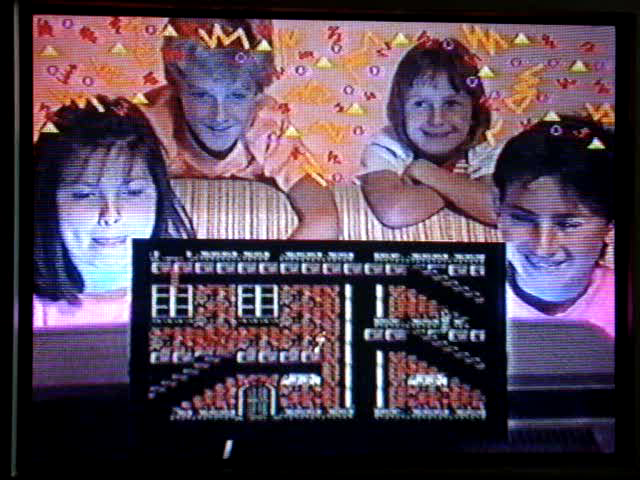 At the time of the article I searched, but couldn’t find it (I did find a photo of myself though, as a child playing a Famicom on Christmas day, but that’s never becoming public). So given that one of my tapes was already dead, it was time to find this Reggies tape. A long time ago, when my parents upgraded to DVD, they were going to throw most of their old tapes out. Their plan was to keep some blanks to record films on TV, but chuck those a decade or more older. Being the nostalgic kind I obviously demanded they give them to me, and so I inherited about thirty BASF VHS tapes – a mixture of 180, 200 and 240 minutes. Luckily they let me keep leave in their loft, and when visiting for the holidays I would enjoy going through said tapes. About a quarter are tapes with kids shows on them, mostly Smurfs. The rest a collection of documentaries (Attenborough's Living Planet) and totally awesome obscure films (My Science Project being one such badass entry). Anyway, around 2003 both my brother and I were over for the holidays, and we decided to have an epic video marathon. So we set the TV, machine and tapes up in an old holiday caravan, and spent a couple of weeks watching most of them (we skipped the documentaries and long series like Lonesome Dove). After exhausting the films we even started watching the Smurfs. Drunk on Christmas wine it was actually kinda cool, and very nostalgic. At one point we also spotted some ads, including those for the Reggies machine. Fast forward to today and I was determined to fine this ad. Well, it’s taken at least 12 tapes, watching the 3 or 4 hours of footage on fast-forward to finally find it. I went through every Smurf tape in the box, assuming the ad was during a kids show, and couldn’t find it. I went through all the kids shows and films – nothing! I did find some cool stuff though: half a Kurt Russell film, where he’s a journalist searching for a serial killer. A video for Tom Petty’s Learning to Fly, broadcast on daytime TV, which BLEW my mind back when I was ten years old (Google it to find out why). Some really cool adverts, including one for Volkswagen, where a guy overtakes one on his bicycle. And a show celebrating the 2nd Birthday of the M-Net TV channel. I also found an old news story regarding the 1993 WTC bombing, which was rather chilling, and also a news story from Waco. The Reggies advert was nowhere to be found though. Right when I was about to give up, I tried an old tape that used to have Police Academy 4 and 5 on it, before my dad used to tape for something else. Fast forward to near the end, and lo and behold, there’s one of the Reggies ads! And how many seconds did I get for wasting my entire Sunday? About 9 seconds. The ironic thing is this isn’t even the ad I was looking for – the one I can recall was much longer, and prefaced by an advert for chocolate Easter Eggs. Still, this is all you’re getting because I really can’t be bothered to spend anymore time on this. I have fulfilled my duty to archive history. 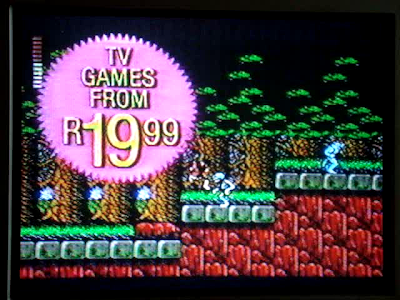 I seem to recall games costing as much 100 Rand though, at least the good NES games, like SMB3. Crappy stuff like Mickey Mouse was about 20 Rand. The advert also starts with what sounds like the sfx from Dynamite Headdy. Weird. I left the follow-up advert in place, since it dates the whole thing. Likely it was recorded Saturday morning, since the next ad talks about M-Net programmes on Sunday 3rd November. Notice how they emphasise that it’s the SA version, implying the correct plug is bundled with the system? Which I think was a result of a lot of stores selling grey-market models from Hong Kong which came with the wrong power adapter (I think my first system actually had a replacement provided by the store, which was a little too strong and soon burned the system out). Any way, it’s not a great advert, but it’s something. Also, while I have your attention, and since we’re talking about M-Net, if anyone has any old monthly M-Net TV guides circa 1986-1995 I would be interested in having one or two of them (for certain research purposes). LOL, I bet Reggie Fils-Aime would love that. We should email him a link! Damnit Sketcz why don't you post more often, you're always finding cool stuff! Fantastic find, well worth the hours of searching! I`ve never heard of this one before but that is a fantastic commercial. For some reason whenever I hear the name Reggie I always think of John Cleese`s character Reg in the Life of Brian, which just makes this so much more amusing to me. So I've been reading about famiclones in the former USSR, and they got all regions games as bootleg games on cartridge (because no laws in those early days), but if they had battery powered saves, they didnt get them (no zelda, etc). Maybe that's how you got that stuff.